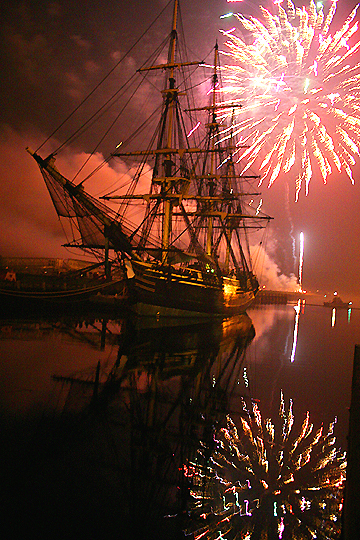 Fireworks reflect off the waters of Pickering Wharf in Salem, MA while the Friendship takes it all in. Photograph by Flickr user snowriderguy. I just published the 100th post here on blog.bigsmoke.us. Who would have thought that when I published my first post? Hopefully, the 1000th post will be a bit sooner than the 100th post; I still keep stumbling upon issues that I wish I had blogged about so that I don’t have to solve them twice. Also, there’s a lot of content that got stuck in the feeling of formality that was induced by having to give it a permanent place on a static website. That feeling made me want to elaborate beyond what was actually in my head at any given moment. This blog induces less and less of such inhibitions, which in turn generated more and more content.